First floor apartment in centre of Aberdour on Fife's South Coast. Sleeps four people in two bedrooms. The Courtyard is a first floor apartment in the heart of the seaside village of Aberdour, just eighteen miles from Edinburgh with easy access via regular train service or in the car across the road bridge. The apartment sleeps four people with one double bedroom and one twin, along with a family bathroom. There is a kitchen and a sitting room with dining area. Outside is off road parking for two cars. All first floor. Two bedrooms: 1 x double, 1 x 2'6'' twin (zip/link, can be king-size double on request). Bathroom with bath, shower over, basin and WC. Kitchen. Sitting room with dining area and Juliet balcony. Fuel and power inc. in rent. Dedicated off road parking space for 1 car, plus additional off road parking space for 1 car within the development on a first come, first served basis. No children under the age of 7, including infants and babes-in-arms. Apartment reached via an internal staircase, there's no lift. Occasional train noise can be heard from the apartment between 6.30am to 11.45pm. Alternative free parking available in station car park 3 mins walk away. The location was great for access to nearby attractions. The bed was very good. Aberdour was very pretty & had sufficient shops & eating places. The apartment was safe & comfortable. 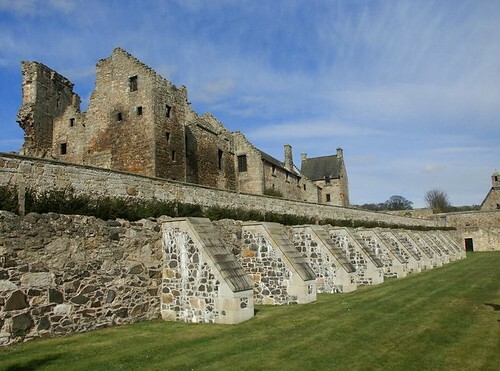 The immaculately kept apartment was in a lovely village with great beaches, fantastic castle, pubs, bakery and a selection of shops, and was also in a prime location for the train to Edinburgh and other areas. We loved the town and the location! We would highly recommend this place! The property is very central in Aberdour. The village itself is enchanting with an interesting history and lovely beach close by. It is within easy access of Edinburgh across the Bridge, the Fife Coastal Path or to the lochs and mountains further north. We would definitely like to come again! Built by the Douglas family, this 13th century fortified house was later extended in the 15th, 16th & 17th centuries. The finished result provides accommodation with a gallery and fine painted ceiling. There is also a walled garden with beehive-shaped doocot.